It took nine long months to get here, but finally, we’ve arrived -- the final. These are two sides many pundits didn’t think would get to this point, but nonetheless, have persevered through injuries and overcome superior talent. Only a mere 7.2 miles, or 20 minutes down the M-30, separates the Santiago Bernabeu and Vicente Calderon. This season's final will be the seventh time the Champions League has seen a final pairing replayed, but it is the fourth time this has happened within three years of the initial match. Hostilities will be high (Here's to hoping my family doesn’t kill each other) and the stakes even higher. Who will claim club soccer’s ultimate prize, Real Madrid or Atlético Madrid? 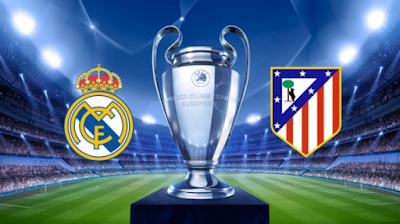 For the second time in three years, the UEFA Champions League final will be a distinctly local affair as Real Madrid take on city rivals Atlético Madrid in Milan. Two years ago the teams met in Lisbon, marking the first final involving clubs from the same city in European Cup history. Atlético led 1-0 deep into added time, only for Madrid to equalize on a last gasp header from Sergio Ramos. Real would go on to win 4-1 after extra time, lifting their tenth European Cup – 'La Décima.' This will be Real Madrid’s 14th European cup final, their record is 10-3. Atlético will be making their 3nd appearance, their record is 0-2. The sides have met in 202 league, Spanish Cup and Spanish Super Cup games, with 102 Madrid wins, 51 for Atlético and 49 draws. Atlético, however, are unbeaten in eight domestic games against their local rivals since losing the 2014 UEFA Champions League final, recording five wins and three draws. - Zinédine Zidane, who scored Madrid's winner in the 2002 final, could become the seventh man to win the European Cup as both player and coach, following in the footsteps of Miguel Muñoz (Real Madrid 1956, 1957; Real Madrid 1960, 1966); Giovanni Trapattoni (AC Milan 1963, 1969; Juventus 1985); Johan Cruyff (AFC Ajax 1971, 1972; FC Barcelona 1992); Carlo Ancelotti (Milan 1989, 1990; AC Milan 2003, 2007, Real Madrid 2014); Frank Rijkaard (Milan 1989, 1990, Ajax 1995; Barcelona 2006); Josep Guardiola (Barcelona 1992; Barcelona 2009, 2011). - Following his goals in the 2008 and 2014 finals for Manchester United and Madrid respectively, Cristiano Ronaldo could become the first player to score in three UEFA Champions League finals. He is one of four players to have scored in two finals, along with Raúl González (2000, 2002), Samuel Eto'o (2006, 2009) and Lionel Messi (2009, 2011). - Diego Simeone could become only the third non-European coach to win the European Cup – the first two were fellow Argentinians Luis Carniglia (Madrid 1958, 1959) and Helenio Herrera (FC Internazionale Milano 1964, 1965). Justin: I don’t know what it is about big games, but Fernando Torres (Atletico Madrid) just always seems to produce a decisive moment. His most famous came in the 2008 Euro Cup final, when he chipped a gorgeous goal over the onrushing goalkeeper, giving Spain their first International title in 44 years. He has featured for the victors in 7 finals for club and country, picking up one Champions League, two European Championships and one World Cup along the way. Torres is yet to have his immortalizing moment for his boyhood club, but if there's room for optimism ahead of Saturday's showdown, it’s that El Nino has been in terrific form and would love nothing more than to lift club football’s ultimate prize into the Milano night. All of the focus was on one individual when the two sides faced off in the final in 2014. Then, star man Diego Costa was selected in the starting lineup despite being nowhere near fit (He ate horse placenta to heal himself) and predictably limped off after his hamstring went again after just nine minutes. Atlético would go on to take the lead, but Real Madrid equalized in injury time after it was evident that Atlético had nothing left physically, having effectively only two substitutions rather than three. This time around, all of the attention has been squarely on the Real Madrid training table, and for good reason. Cristiano Ronaldo (Real Madrid) has been dinged up ever since a muscle pull in his thigh in late April, something severe enough to force him out of the 1st leg of their semi-final against Manchester City. He returned for the 2nd leg, but was clearly not his best, missing opportunities he would have normally buried in his sleep. Held out of the scrimmage on Saturday, Ronaldo returned to training on Tuesday, but again limped off hallway through after colliding awkwardly with GK Kiko Casilla. While he immediately stated that he would be fit come game time, there have been similar proclamations made about Ronaldo’s fitness in the past, only for him to be less than 100 percent. Even at less than peak fitness, Ronaldo is a force to be reckoned with, but against this defense he will have to capitalize on the few chances he gets. Alejandro: Well, this doesn’t happen very often. To be precise, this will be the seventh time in the history of the prestigious Champions League, the pinnacle of European club football, that two teams meet in a rematch of the final. Indeed it has become somewhat of a more recent trend with the last two occasions, AC Milan v. Liverpool (2005,2007); and Barcelona v. Manchester United (2009,2011) setting the pace for these meetings to happen at exactly two years apart. This year Atletico will hope to redeem themselves like 2007 AC Milan, who avenged a brutal 2005 loss in PKs to Liverpool after leading 3-0 in the second half. As both Justin and I have repeatedly stated throughout this series of previews, Real Madrid’s star power makes them such a formidable squad, that they almost MUST be favored in every matchup. The loss of their iconic keeper Iker Casillas at the beginning of the year opened up the doors for skepticism about how they would handle a replacement for such a key figure. But Costa Rican hero Keylor Navas has settled in between the sticks and is establishing himself as a suitable successor to the legend. This final will be one of the biggest tests for Navas, as he will be facing the attacking prowess of Atletico Madrid’s own legend El Niño Fernando Torres, and their French Phenom Antoine Griezmann. Despite all the talk about Cristiano Ronaldo’s health, the Portuguese star has stated again and again that he will undoubtedly be match-fit for Los Blancos. Speculation on what his actual status is or will be could take up every second until the match actually begins. But time would be better spent on players that have their plans set in stone. Zinedine Zidane has selected to include Casemiro (Real Madrid) in his lineup, while the Brazilian certainly offers an imposing presence in the midfield, it is questionable if he will be able to contain the speed and skill of Griezmann who is at his best when he is fed the ball from Koke (Atletico) on the wing. Justin: This matchup is fascinating on so many levels, that one factor alone will not be the decider, but let's start in the midfield. It’s been long forgotten now, but there was a point in time Real Madrid absolutely owned Atlético, winning 25 matches in a row over a 13 year period. Since snapping the streak in the 2013 Copa del Rey final, Los Colchoneros have had the upper hand in the rivalry (at least domestically) mainly because of Real Madrid’s lack of balance and physicality, particularly in the center of the park. Atlético’s ability and willingness to sit deep and stay compact can limit Real Madrid’s main weapon of their blistering pace on the break. Modric (Real Madrid) and Kroos (Real Madrid) are maestros on the pitch when given the ample space, but when surrounded by defenders and pressure, they tend to struggle. It is imperative that Atletico stay true to their values, and limit the passing lanes of Real’s midfield in feeding it’s wingers. For Real, their defense will be key. Atlético’s counter-attacking is their chief threat, mainly through Antoine Griezmann, who can single-handedly expose Real Madrid’s backline if given the chance. Marcelo (Real Madrid) tends to fancy himself as an unofficial winger, often bombing forward, leaving his defensive responsibilities in the rear-view. Sergio Ramos (Real Madrid) can be equally as ambitious, often committing rash fouls in retreat that directly lead to advantageous free-kicks for the opposition. Real will surely dominate possession through most of this match, making it imperative that the back line doesn't lose focus and allow through balls to be played over the top. All Atleti needs is the first goal and the game could be effectively over, their defense is that good. Whoever scores first will dictate their style of play to the other, forcing somebody to get very uncomfortable in the process. Alejandro: I don’t usually like agreeing with my counterpart Justin (there’s no fun in that), but I will concede one basic point: midfield play will be a deciding factor. Both attacking formations call for sweeping balls to be crossed in from the wing but each has their distinct spin on things. Real Madrid have the luxury of Gareth Bale and Cristiano Ronaldo playing those positions, with each player more than capable of taking the ball in and causing havoc in the box, or by pulling the trigger and bruising Jan Oblak’s hands (Atletico) from 30+ yards out. Atletico is much happier with things being a bit cagey. They will keep a tight formation and try to contain running from Real Madrid’s attack. To be blunt and rebut Justin’s exaggerated claims, Toni Kroos (Real Madrid) has been disappointing (read: shite) during his time in Madrid. Luca Modric (Real Madrid) has more of a proven record and his skill on the ball and delivery of pinpoint passes is unquestionable since his Tottenham days. However, Kroos has been just plain ineffective playing in a deeper position than the one he shined in for Bayern Munich, as well as the German national team. With Casemiro being in the match, Kroos will certainly have the opportunity to venture further upfield as he likes to do and if he is given enough space then he can certainly make Atletico pay. But that is a big “if” given the defensive prowess that Diego Simeone has established in his Atletico backline. Diego Godin and Filipe Luis (Atletico Madrid) are both shut-down defensemen who also have the ability to terrorize opposing teams' boxes on set pieces. The deciding factor in this final will be whoever can organize themselves in the heat of the moment and maintain their respective style of play. Coming into this match with a chip on their shoulders, the Atletico players will want to dictate terms throughout, given the talent and experience of Real Madrid, this will be no easy task. Justin: Saturday will pit two teams from the same city, but in terms of their philosophy, both on and off the pitch, they could hardly be more different. The team with “royal” in their very name will depend on its expensive superstars to pull this one out with individual brilliance, while the team of the working class play as a singular pulse, with all-out defensive intensity and cohesion for 90 minutes. Based on the degree of competition faced thus far, and overall performance, Atletico have to come in as favorites, and dammit, I would be stupid not to agree. But before this competition began I picked Real Madrid to win it all, so how would I look now if I flip flopped? It still remains true that no other side in the world knows how to play in these sorts of games better than Los Blancos. In the end, I think we will see these sides go into extra-time once again, with Real Madrid triumphing by a score of 2-1 on a goal from Gareth Bale. Alejandro: Nobody tell me...let me guess...Justin picked Real to win didn’t he? He might be onto something with this one. But there are so many issues going into this match that make it difficult for me to agree with that prediction. The status of Cristiano Ronaldo, the extra drive that the desire for vengeance will provide for Atletico, how stupid Casemiro is, etc...but I digress. In all seriousness, Atletico Madrid will not go down lightly. This will absolutely be a final to watch in awe, as the teams battle to determine the Champion of Europe. For all the reasons listed above, I would be remiss to not select Atletico Madrid winning and exacting revenge, 3-1.